Other Products by AST Sports Science. Search other Hydrolyzed Whey Protein products. AST Science MyoGenin - The world's first active protein. AST MyoGenin is a revolutionary new “Active Protein Substrate” designed to activate mTOR for greater protein synthesis and increased muscle growth and strength. Introducing AST Science MyoGenin, a revolutionary new 2-phase, leucine-specific, hydrolyzed whey protein phospholipid hybrid, engineered with ground-breaking, Integrated mTOR Activation Technology™. MyoGenin is unlike any other protein in the world and delivers a major breakthrough in muscle-building protein synthesis. Until now, your choices have been whey protein, casein protein, egg protein, soy protein and various blends of these. AST MyoGenin is a completely new category of muscle-building protein. It’s a hybrid protein, integrating a proprietary engineered hydrolyzed whey protein with leucine-specific, 2-stage active enzymes interfused within a phospholipid matrix. This advanced and very unique protein hybrid is engineered to activate mTOR by releasing ultra-high levels of leucine peptides in the body. No other protein, or supplement, or even pharmaceutical compound provides this type of target-specific activity. MyoGenin is not just a whey protein with added enzymes, it’s an entirely new protein substrate – an “Active Protein”. The active enzymes in MyoGenin are integrated and protected within the protein structure by a special phospholipid membrane and are engineered to actively target and cleave the attachment sites of leucine on the peptide chain. This target-specific activation releases a flood of leucine within the body from the bioactive peptides after it’s consumed. Unlike other hydrolyzed proteins where peptides are randomly cut from the protein chains, MyoGenin’s active enzymes specifically cleave leucine from its peptide attachment. This leucine-specific hydrolysis and integrated enzyme technology in AST MyoGenin is the pinnacle of protein science. The leucine peptides from MyoGenin activate mTOR to dramatically increase muscle-building protein synthesis. 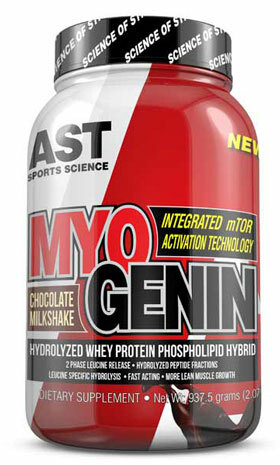 AST Science MyoGenin is truly an engineered protein like no other. Leucine is the primary activator of mTOR – the main cellular signaling complex for up-regulating muscle protein synthesis. Unlike other proteins, MyoGenin, with Integrated mTOR Activation Technology™, floods your body with mTOR activating leucine in 2 stages. When mTOR is activated, muscle protein synthesis increases dramatically. MyoGenin is engineerd to dramatically increase mTOR activity igniting greater protein sythesis and rapid muscle growth! The greater the activation of mTOR, the more muscle protein your body will synthesize and the more muscle you will build. With MyoGenin, you’re not just consuming grams of protein, you are taking an “Active Protein Substrate” that is engineered to deliver specific signals to the mTOR that trigger protein synthesis and greater muscle growth. While providing a potent protein punch, MyoGenin’s exclusive Integrated mTOR Activation Technology sets it above all other protein supplements by activating mTOR to an extra-high degree. With MyoGenin, the muscle-building game has changed. MyoGenin is the future of muscle. Mix 1 scoop of MyoGenin in 175 - 235ml of cold water or milk and drink immediately. For best results consume within 1 hour after training. This is when mTOR activation is most critical. The other best times to take MyoGenin is befor bed and upon waking, to keep you activating mTOR and maximising muscle-building protein synthesis. INGREDIENTS: Hydrolysed Whey Protein Phospholipid Hybrid, Cocoa Powder (Dutch Process), Natural & Artificial Flavours, Gum Blend (Cellulose Gum, Xanthan Gum, Carrageenan), Soy Lecithin, Enzymes, Acesulfame Potassium, Sucralose. CONTAINS: MILK & SOY.